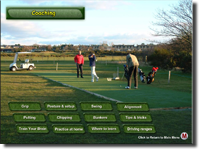 Described as a 'moving book' the coaching section uses a combination of video, photographs and text to cover the most important elements of golf instruction, i.e. the correct grip, posture, setup, alignment and swing. Produced in collaboration with a PGA Professional this section also covers -the short game, bunker play and putting and includes some useful and amusing tips! 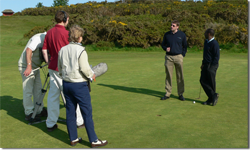 The instruction given on The Golf Scene is especially useful to re-inforce all aspects of professional coaching.